Just hot off the press is our new XO range. 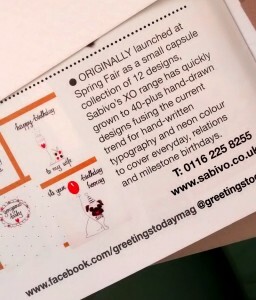 We launched it at Spring Fair 2015 and here is the original blog post about it. We quickly expanded it as it was so popular with retailers. We are delighted to see it appear on the pages of April’s Greeting Today Magazine, a must have read in the greetings industry. To see the whole editorial jump to page 40 for more details. We have pugs, flamingos, candles, cakes, owls etc., but above all many neon love hearts that surely will delight most customers. Photos do not give justice to the lovely simplicity of the designs, so if you are a retailer and loving the minimalistic look, please get in touch for your complimentary sample and a trade catalogue.